The Deschutes Brewery Pub is also known as the Bend Public House. A fixture in downtown Bend since 1988, it’s also the site of the original brewery, which quickly grew into a gathering spot for locals and visitors to Bend. The pub has a total of 19 taps with many of their year-round making room for an array of seasonals to choose from, and it’s always featuring something special you won’t find anywhere else in a bottle. 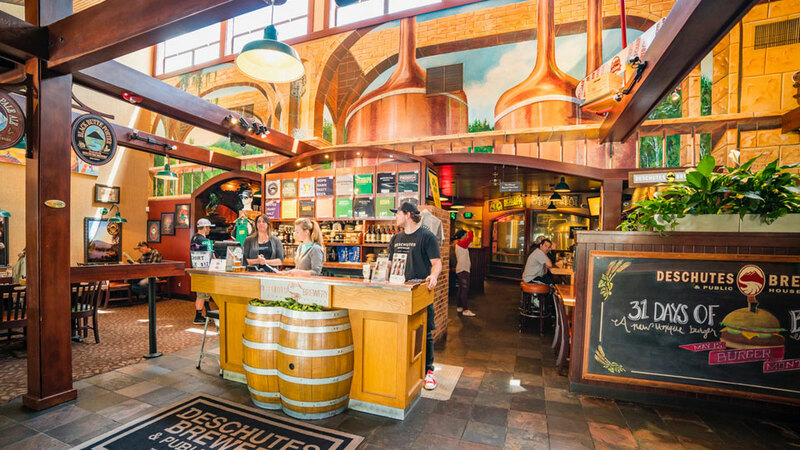 If you love Deschutes Brewery beer, it’s worth waiting to get a pint of something for bragging rights back home. The pub menu is focused on natural, sustainable, locally sourced, house-made fare. All the dishes are beer-centric, with several items made using spent grain from the brewing process, but that doesn’t mean it’s a typical pub menu. The Tap Room, upstairs from the main pub, is a casually upscale space available for hosting special events, from wedding receptions to after-work corporate mixers. Featuring 16 Deschutes tap handles, the Tap Room specializes in pub-style events and custom beer-paired dinners for parties ideally between 30 to 100.